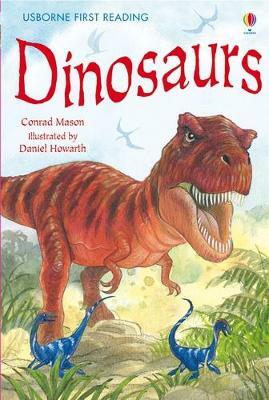 Part of the First Reading series, part of the Usborne Young Reading Programme, and suitable for children who are beginning to read, this title offers a gentle introduction to the time of the dinosaurs, with a glossary and pronunciation guide. It helps to motivate children as they... read full description below. This is a new title in the fantastic First Reading series, part of the Usborne Young Reading Programme. It is aimed at children who are beginning to read. It offers a gentle introduction to the time of the dinosaurs, with a glossary and pronunciation guide. Developed in consultation with Alison Kelly, who is a Principal Lecturer in Education and an early reading specialist from Roehampton University, every title in this series features clear and compelling text accompanied by charming and highly appealing illustrations. It is designed to motivate children as they learn to read.